This Groovy girl organic placemat means that your little one eats safely on a clean surface away from chemicals. The neat little pouch houses the cutlery and keep it clean and tidy. The placemat can be folded, rolled-up and fits virtually anywhere. It closes with simple matching ties. The unique folded design makes sure that no part of the top layer is rolled onto the soiled bottom. It is the perfect accessories for adults as well as little students, preschooler and babies on the go. 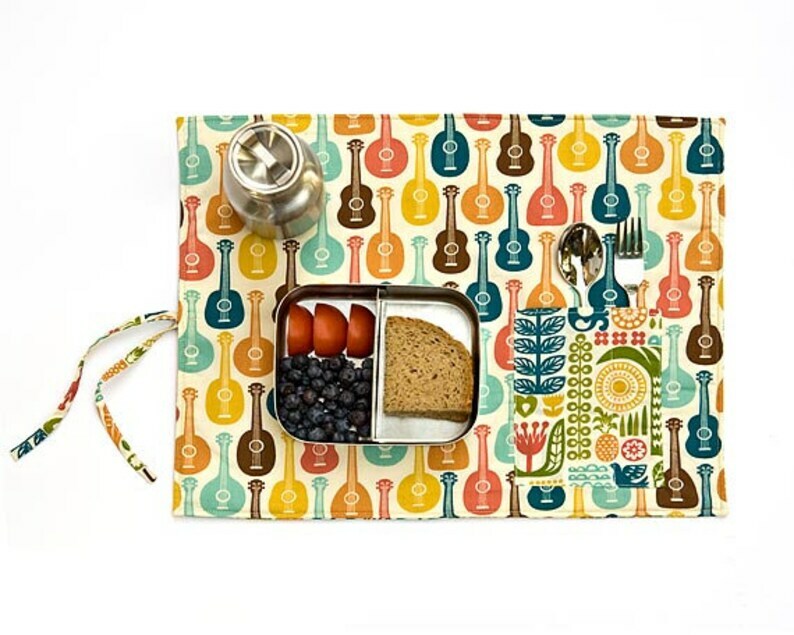 This quilted placemat is made with gorgeous organic cotton for both outside layers. A light padding serves as a cushion to help your little one's lunch to be as quietly and peaceful as possible. This padding is made out of organic cotton. The place mat closes with a matching strap. The organic place mat measures 16" 1/2 x 12" 1/2 (42cm x 32cm). Ist sehr schön und toll verarbeitet! Boy birthday gift. Viking map placemat in organic coton for eco friendly kids.